Hot on the heels of the exciting news of Kino’s Gaumont Treasures vol. 2 release comes what should be one of the silent feature film DVD releases of the year. 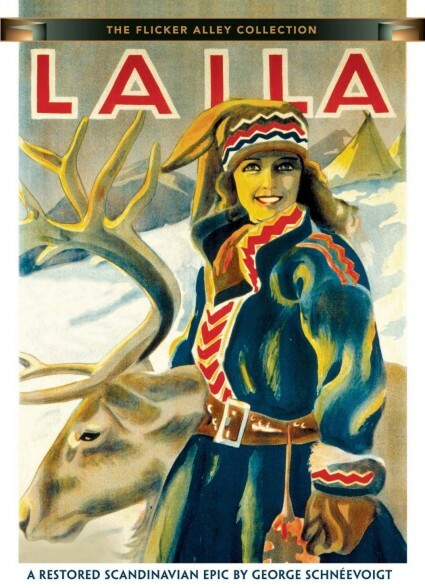 Regulars will know that the Bioscope was mightily impressed by the Norwegian film Laila (1929) when it was shown at Pordenone in 2008. Now it is to be released by Flicker Alley on 11 April, and I can only say that every good silent home should have one. It’s a bold move by the American label to release a silent that isn’t a part of the canon and isn’t covered in any film history outside of Scandanavia. But I think word of mouth is going to do the trick and justify their faith in the film. The rediscovery that sent us out into the streets, if not with the intention of dragging in passers-by then certainly floating on air, was unexpected. Laila (1929) is a late Norwegian silent, a daunting 165 minutes long. Expectations were not high from those like me who knew little of this period of Norwegian cinema, though the presence of George Schnéevoigt, cinematographer on a number of Carl Th. Dreyer film, as director, had aroused curiosity. We were gripped, and we stayed gripped throughout, as this immaculately-paced drama in the remotest of landscapes held you like only the best of silent films can. Exoticism was certainly part of the appeal – age-old, etched faces, rampaging wolves (running over the camera at one point), clashes between Lapps and Norwegians (disparagingly referred to by the former as ‘daros’), some fine ski-ing, and an awful lot of reindeer. Lying just underneath the narrative was a miscenegation theme, as the grown-up Laila (brightly played by Mona Mårtenson), kept in ignorance of her Norwegian parentage, is brought up to expect marriage to Laagje’s foster son Mellet. The film seeks to rescue her from this fate, preferring that she marry instead her first cousin, Anders Lind (Harald Schwenzen), who ends up rescuing her at the altar in a satisfyingly dramatic conclusion, thanks to an intervention from Jåmpa (Trygve Larssen), who puts Laila’s happiness above loyalty to his master (and gets savaged by a pack of wolves for his pains). This was a work on both an intimate and an epic scale (it is based on a novel by J.A. Friis), excellently played in a fine naturalistic style by all concerned. It was good human drama. It’s hard to make a dull-looking film when you have so much snow to work with, and Schnéevoigt did not fluff a single scene … Fresh, unusual and soundly executed throughout, Laila was the outstanding feature film of the Giornate. I hope that’s whetted your appetite. You won’t be disappointed. (9:30 p.m. on April 3 pacific time). Thanks (you’re the first to tell me). I’m in the UK so don’t have an eye on these things. It feels astonishing that you get silents shown with some regularity on TV in the States. Here it’s like they never existed. San Francisco) a silent film is shown, as a rule, and occasionally at other times. Let me say how impressed I am by this Bioscope site. Have just found it and am busy exploring all it has to offer. It’s a marvel. Thank you. It’s all thanks to the free time I have because there aren’t any silents on TV. At least!! !… Having in mind that in the Schloss silent archives there is only a shorten version of such wonderful silent oeuvre, this Herr Graf is looking forward for this excellent restored editon by the longhaired youngsters at “The Flicker Alley”. I just watched this phenomenal film on TMC. I had trouble seeing the subtitles as many times they were lower than my TV screen would pick up, but I didn’t need to really see the subtitles to become spellbound by this film. I would like to purchase this, now that I have seen it. Oh my goodness… I need this film in my collection. Is it just me, or was she so impossibly beautiful at the end. I just need a still from the church scene . :P I would hang that on my wall any day. Still… So amazing. Aha, this is why so many people have been coming to the blog about Laila – it’s the TCM screening. I’m delighted it’s had such a positive reception. It is a film with something for everyone – certainly a silent film to show both to those who love the medium and to those who can’t believe there is anything to it. I hope the DVD will spread its fame still further. I totally watched this last night…. staying up until 2am to finish it. Let me first say I had never watched a silent movie before, but there was something about this. I talked about it at work this morning and people thought I was crazy. I am SO GLAD to find this blog! I have forwarded the link to all! Ah, there’s nothing quite like turning up at work and telling everyone that they missed out because they didn’t see the great Norwegian silent film on the TV last night! thrilled and so proud to see this amazing film. I cannot recall the name of the piece being played at the piano as they were discovering their love for each other. Can anyone help ? Spectaculae movie ! Just watched it last night and was amazed by it. The scenery was breath-taking and the story kept our attention all the way through. Hard to believe it was filmed in 1929!